One of the most intriguing books yet. Good Book, better tea kettle. The planet of Caliban exists much as it has for thousands of years - the knightly orders protect the common people, fighting back the beasts that lurk in the depths of the seemingly endless forests. Young Zahariel and Nemiel aspire to join the greatest of the orders, led by the example of mighty Lion El'Jonson and his vision of a peaceful and unified world. 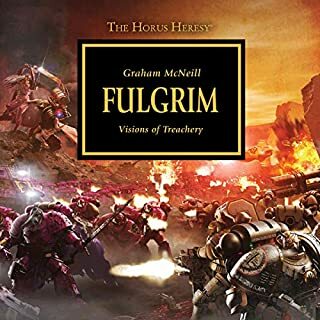 But the coming of the Imperium brings new concerns and a new destiny for the Lion as part of the Great Crusade, and the sons of Caliban must decide if they will follow him to glory among the stars. 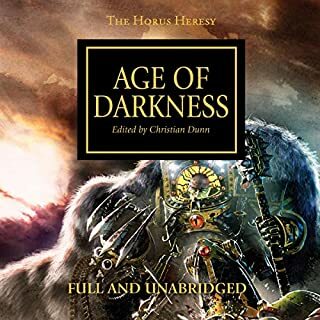 recommended listen to anyone who is a fan of the horus herasy. probably my favorite so far. Was never a fan of the dark angel but was recommended this book by a friend and I have to say it may be one of my new favorites. 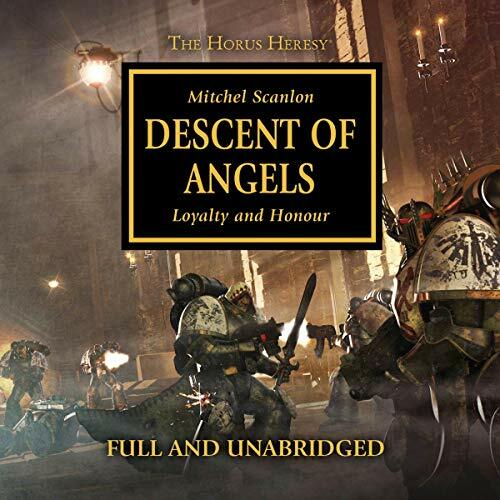 What did you love best about Descent of Angels? I loved getting additional lore and backstory about the Dark Angels. The story was about the coming of the Emperor and the creation of the First Legion. It has almost no tie in to the actual Horus Heresy. 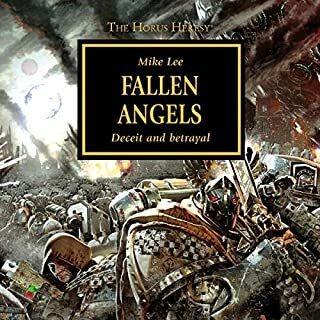 So as a tale about HOW the Dark Angels end up the Dark Angels of the 41st Millennium it's not bad. As a story of the Hersey it fails utterly. Have you listened to any of Gareth Armstrong’s other performances before? How does this one compare? 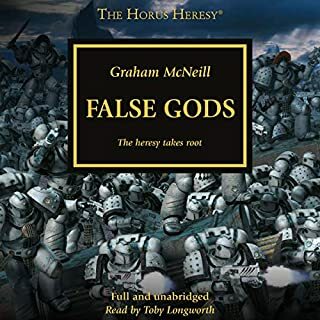 I have listened to Gareth Armstrong on several other Black Library books, and he does a very good job telling this story. You always have a feel for who is talking due to the inflection of the character's 'voice' and he is very clear and brings a lot to the tale. Not really. The story felt kind of disjointed and at times it was hard to tell the passage of time. Some events were told as if they took mere hours or days but took weeks. Other events happened concurrently or behind other events in the book. The story itself could be tighter and better told. I am glad I have listened to it. I'm not necessarily thrilled with the story itself. But then I'm not the biggest fan of the Dark Angels, so there is that. 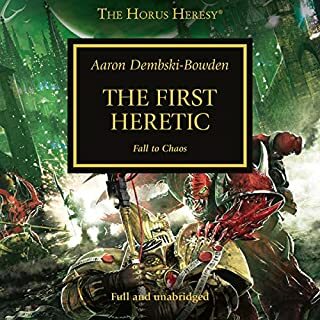 Great book that im assuming was only written to inroduce the primarch of the first legion the dark angels and give a full backstory. otherwise this book is mostly unrelated to everything that has happened in the rest of the series so far. 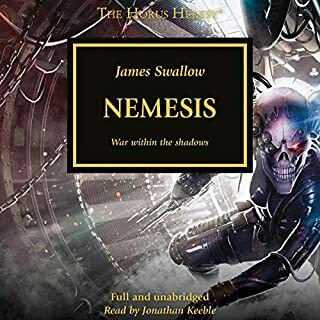 that being said it was a great book maybe my favorite in the series yet and a needed break from the main storyline, i cant wait to see how they tie this together once the lion enters the war with horus. The one glaring flaw in this book is the abrubt ending, epilogue really wasnt enough either. Narrator was amazing! Great story, however Gareth’s delivery when voicing Zahariel & Nemial is terrible. He kept the same pitch and tone of them from their child & teen years into their adult Astartes years, very cringeworthy & immersion breaking thibking of a full grown Astartes that sounds like my 9 year old nephew, and thats just my take on these 2 characters mind you. Still, Mitchel Scanlon wrote a really good novel & it is worth reading/listening to. This book shocked me. I've heard many fans of the series say that this is one to skip, but I beg to differ. 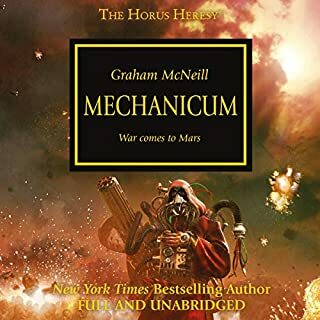 While it isn't much like a Horus Heresy book (the characters are not space marines for the majority of the story) it is the first story that gives true insight about the nature of the homeworlds and the people that come from them. We learn about how Lion El'Johnson tries to come to terms with his utterly different nature. How a legion homeworld is transformed by the arrival of the Imperium. And how the people who ascend to become Space Marines cope with the transition from their old life to their new one. The characters are rich and interesting, though I would say that they fit into established archetypes and we already know who the characters are shortly after they are introduced. 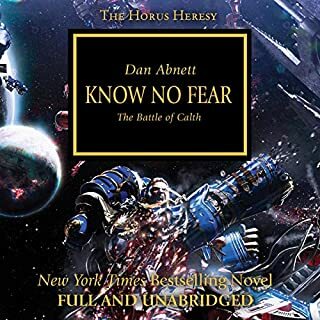 While the story is used to develop Lion El'Johnson and Luther, the story still takes time to develop the rank and file trooper, a precedent that was set by Abnett in Horus Rising, but not followed by most of the Heresy's authors. The narrative shift mid-book is shocking, but does an excellent job showing the culture shock that the knights experience in the transition. 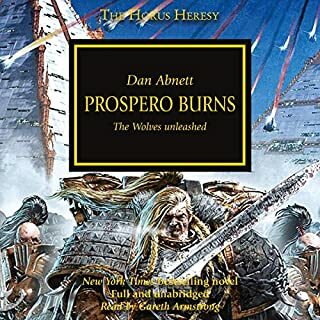 Gareth Armstrong captures the mood of the story well, and, while he's not my favorite Black Library reader, he fits this story's telling. It's easy to tell the characters apart, and he captures the imposing personalities of the Lion and Luther very well. Who is this story for? 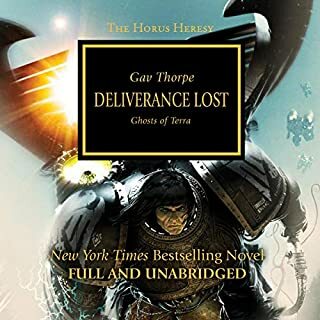 I would recommend it for sci-fi and fantasy fans alike, even with no prior knowledge of Warhammer 40,000 or the Horus Heresy. 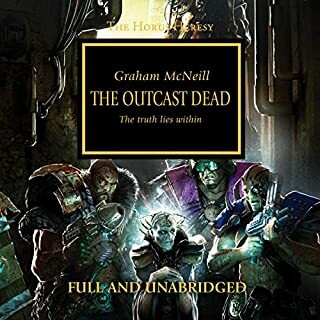 It is far enough removed from the story to be an excellent stand alone, though it will feel somewhat incomplete at the end. 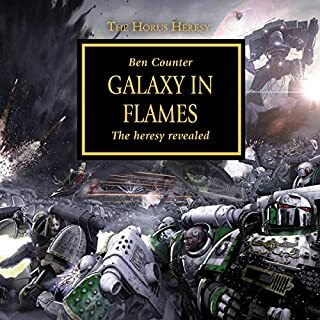 Horus Heresy and 40,000 fans might be taken off guard, because it does not read like a typical Warhammer novel, and they should be aware the nature and focus of the book is fundamentally different. 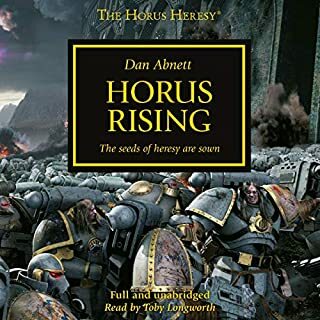 But, much like the Ciaphus Cain novels, I think that this change of tone is an excellent move for Black Library to give its readers a breath of fresh air, and to help contextualize the world that the stories take place in. 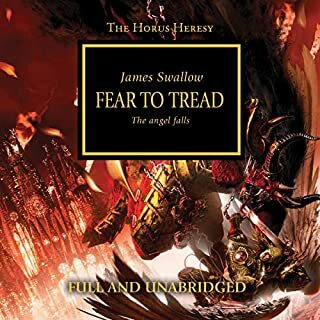 This is a great break in stride of the Horus Heresy series. It has great character development, a good story that instead of delving into the grim dark of the 30th millennium starts us off on Calaban, a almost feudal age world. More then 60% of the book is based here, this gives us time to flush out characters and personalities. This is a drama filled book with adventure, action, mystery and a ending that will leave you a little sad, wanting to know more. If you are a fan of Sci-fi, you will probably like this book, if you are a fan of fantasy, you will probably like this book. 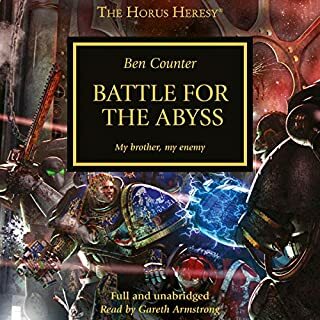 If you are a fan of both, you will love this book, this is not a book to be skipped over in the Horus Heresy series. 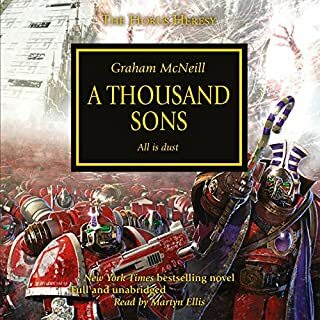 Engaging story and performance from beginning to end - a must have for your 40k and Dark Angel library. the book is sloooow at first. it doesnt pick up till the 20th or so chapters. 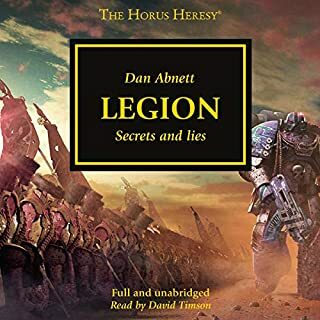 I enjoyed the experience of hearing the backstory to one of the greatest legions in the series, at times the story had long breaks from action though and I wished for more story, can't wait to hear more stories of the lion and dark angels. 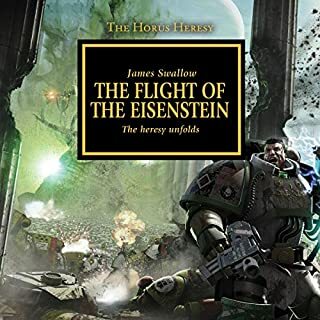 i don't see how it ties into the hores heresy just yet, but it is a very interesting origin story for the dark angels.